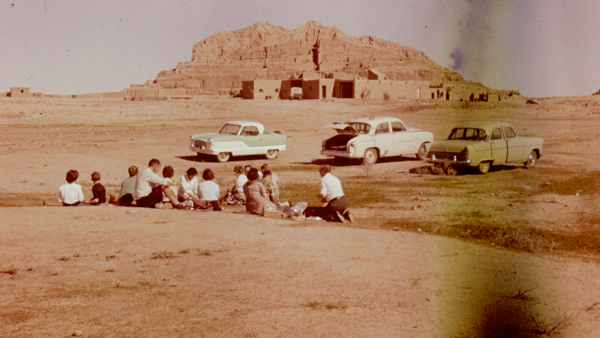 While investigating her late parents’ involvement with the Anglo-Iranian Oil Company (now BP) the filmmaker comes across the letters of a petroleum geologist in Iran in the 1930s, who would later embark on a search for the origins of ‘civilisation’. The film sets out on its own exploration, to decipher signs from the fragmented images buried in the BP archive. This journey through images of the past interweaves stories drawn from both personal memory and from the records of an imperial history, and gradually builds a picture of a 20th century colonial encounter. Based in London, Miranda Pennell originally trained incontemporary dance, and later studied visual anthropology.In recent essay films such as Why Colonel Bunny Was Killed (Courtisane festival Award Winner in 2011) or The Host she investigates the contemporary legacy of colonial politics. Working with archival material, she explores the tensions between still and moving images as a contribution towards a new approach to the historical representation of the colonial imaginary.